sogrady: (Stephen O’Grady) OK, so we’re all a week out from AWS’ annual re:Invent show, which is maybe a tenth of the time needed to digest everything we learned there. So let’s start with the first question: what were you general impressions of the event? rachel: (Rachel Stephens) It was big; by far the biggest conference I’ve attended. kelly: (Kelly Fitzpatrick) This was my first tech conference as an analyst. It was mad crazy busy. 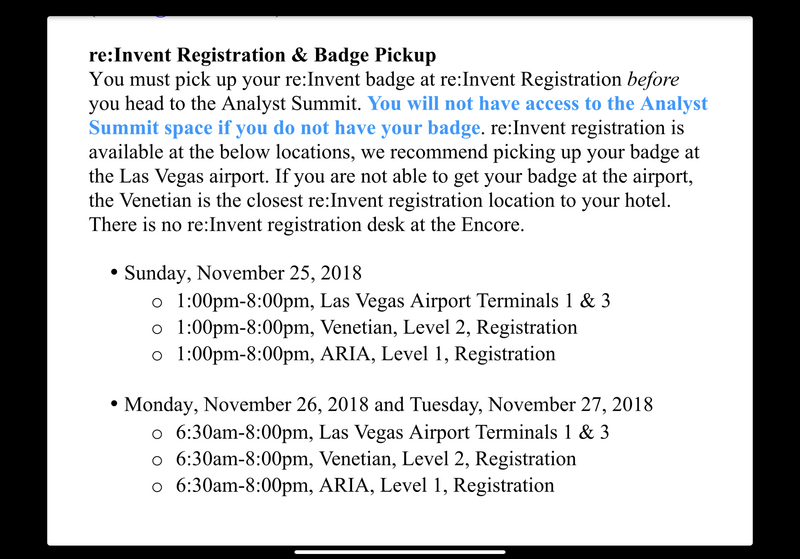 monkchips: (James Governor) The scale of re:Invent is indeed pretty insane. kelly: I think I walked 4 miles on the first day. Mostly inside of the venues. sogrady: Did anyone hear an actual figure for attendance? I know it was big because they (finally) spread everyone out to more hotels. sogrady: That feels about right. I wonder how much longer they do it in Vegas. kelly: One of the cab or Uber drivers Rachel and I had mentioned that they thought this was one of the biggest events held in Vegas (if not THE biggest event). sogrady: @kelly: CES is a lot bigger. And I think, of all things, the cement conference is at least as big as that. sogrady: But anyway, that’s all logistics. What did we think of the show from a content perspective? rachel: I feel like the logistics sprawl and the content sprawl are related. So. Many. Announcements. monkchips: Well let’s just say AWS crushed it. Again. Velocity and variety of new service delivery continues to be impressive to the point of absurdity. I believe Jeff Barr wrote 28k words for the conference in the month leading up to it. Product groups start putting stuff out about three weeks before, so they don’t get swamped in the rush. sogrady: Confirmed. Pretty sure I took something like 6000 words of notes out of a half day’s worth of sessions. There is nothing like the AWS firehose when it comes to product launches and announcements. kelly: I feel like I spent my 3 days in Vegas mostly 1) walking 2) typing 3) gin. And the gin was necessary to process all of the information. monkchips: I was particularly impressed by the fact AWS is serving different masters so effectively. You’re a traditional enterprise? Oh sure we’ll support that old legacy stuff, join us, we’ll totally help you, let me just carry your water, and while you’re at it, can I chop some wood for you? Legacy file systems? Supported. NTFS – bring it over here. Oh you’re an HPC shop running Lustre – oh yeah bring those workloads over here. FTP? Yeah we love FTP – we support the hell out of that. Oh you want next generation container-based operator infrastructure – here’s what you need? Oh you prefer Lambda. Yeah we’re going to make development so darned easy. sogrady: Which is a great transition to important takeaways. One of the most important from my perspective was the degree to which AWS understands that it’s on a cycle here, having achieved initial success and traction with developers who in Jassy’s words were “ignored” and “constrained,” and is now moving up to boring enterprises. What were all of your most important takeaways? monkchips: The “boring” stuff. I started my career being called “legacy boy”, so I see no need to change now. Important takeaway – AWS is ready for the next 95% of the market. sogrady: Or at least intent on being ready for it. kelly: LAMBDA. In the few months I’ve been at RedMonk, I’ve heard a lot of questions about where “Serverless” is going. The tools and functionality that came out around Lambda really drove home for me how much AWS is making functions happen. sogrady: @kelly depending on how you define “Serverless,” anyway. monkchips: Wait – didn’t Rachel come up with a great new definition of Serverless, which encompasses everything? kelly: @rachel: you did come up with a great definition. rachel: Managed services that scale to zero. rachel: It feels like there is increasing movement from all the cloud providers to make functions a subset of serverless rather than synonymous with it. As for takeaways, perhaps it’s confirmation bias since I’ve been interested in the “cloud moving into data centers” announcements at conferences this year, but Outposts was particularly interesting to me. It’s not as flashy as driving a semi-truck on stage to talk about getting your data to the cloud, but meeting people on-prem feels bigger. sogrady: @rachel it takes Google’s GKE-on-prem announcements and AWS’ own RDS via VMware announcements and goes further. Much further. sogrady: Ok, next question: what did AWS do right and wrong at the show? kelly: For having soooooooo many product announcements, I thought they did a great job of 1) rolling them out 2) making use of the football-field run of screens at the keynote to visually demonstrate what all of those items look like at once. rachel: Oh, that’s a good point! Having their list of products span the entire keynote hall was impressive. That can play to both good and bad. It was mind-blowing functional coverage, but also…how are you ever supposed to navigate a catalog with that breadth? kelly: And there was no point where you could even see the entire list! monkchips: There was a lot to like. Information dense, but obvious takeaways. Some surprises, but not too many. In the keynotes their story-telling was surprisingly good. The usual one two of Andy Jassy talking enterprise, then Werner talking tech worked excellently this year. Werner Vogels in particular was on fine form. He looked fitter than than the last couple of years and he nailed it with a tour-de-force performance, starting with a failure, an AWS failure, his worst day at AWS, before moving through some lovely computer science, before announcing his best day ever at the firm – switching off Oracle. 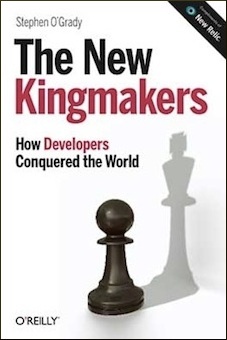 For many customers the story will resonate, and the comp sci was on point. Distributed Consensus never gets old. Should we list all the announcements, now, @sogrady? sogrady: Sure, if you want to edit the chat yourself. sogrady: Personally, I thought the highlight of the show, as always, was the sheer breadth and reach of the announcements – hell, they even got into outer space this year. It would have been nice to see more women in particular on stage, however. kelly: @sogrady: There was a definite bro vibe at times. I would like to see more sessions like The Container Power Hour with Jess Frazelle, Claire Liguori, and Abby Fulller. rachel: Agreed. Part of it is the nature of how they structure their keynotes where Jassy and Vogels drive pretty much the whole thing, but that was definitely noticeable. sogrady: Well, I guess it’s good that AWS has something to work on, given how they crushed the announcements. monkchips: To be fair to Werner he had two impressive engineering leaders on stage that are women. I would argue he has received the message. That said I want to see Abby Fuller in his keynote every year, and my favourite session of the conference was Abby, Clare Ligouri and Jessie Frazelle doing a Containers “Hour of Power” on Monday. sogrady: Ok, next question. What did the show mean for AWS competitors? Am waiting for the year that reInvent goes full Red Wedding, locking the doors and announcing that every attendee's product or service is now a forthcoming AWS offering. Or maybe that was this year? monkchips: There is never good news for AWS competitors at re:Invent. Indeed arguably this was the year AWS brushed off competition from Kubernetes, which sort of had AWS on the back foot for a while AWS is taking Elastic Container Services on prem with VMware. And the Firecracker launch went very well. The Web Scale container community went ga ga for this announcement, which also had AWS doing open source first for the first time. On top of that, it’s a high profile success story for AWS’ Open Source group. rachel: I think the AWS Timestream announcement is going to be an interesting one to watch in terms of helping time series databases move more mainstream. There are a growing number of use cases for time series data, but the category has felt fairly niche up until now. monkchips: @rachel can’t agree enough. AWS has done more than anyone to get people comfortable with special purpose databases. sogrady: I agree, but wonder if time series vendors will see it as a help. Pretty much every software vendor these days dreads the entrance of AWS into their market, as we’ve seen with all the questionable licensing decisions from commercial OSS providers, among other examples. monkchips: The AWS customer preview for these services is generally bigger than the entire number of customers in market beforehand. Everything Else is a Rounding Error. rachel: I feel like we’re all avoiding the b-word. But I do think Amazon declaring that it has determined there are legitimate customer use cases for Blockchain is also market making. monkchips I don’t mind talking about AWS Quantum Ledger as a distributed computing platform, but that is a different thing. rachel: That was my favorite part of how they approached the announcement; they spent as much time on stage separating out use cases and talking about a database as they did blockchain. sogrady: Ok, we’re getting close to the bottom of the hour, so let’s wrap up with a simple question: a year from now, what will be the announcement from this re:Invent that we look back and recognize as the most important? My bet is Firecracker, for multiple reasons. monkchips: My sleeper announcement was indeed Quantum Ledger. That said, I think AWS dramatically opened the funnel for Lambda, a platform which is already crushing it, with Ruby support, and more importantly custom runtimes. kelly: Firecracker. Both from the buzz around the announcement, and the messaging I’ve seen since. rachel: I can’t decide. My inner data nerd loved all ETL announcements, but that feels like a terrible bet. But making data easier to manage is going to make ML a much better proposition for customers. And people love ML. sogrady: Ok, so ETL announcements it is. We’ll check back on these in a year. And on that note, we wrap. Thanks for your time, folks. 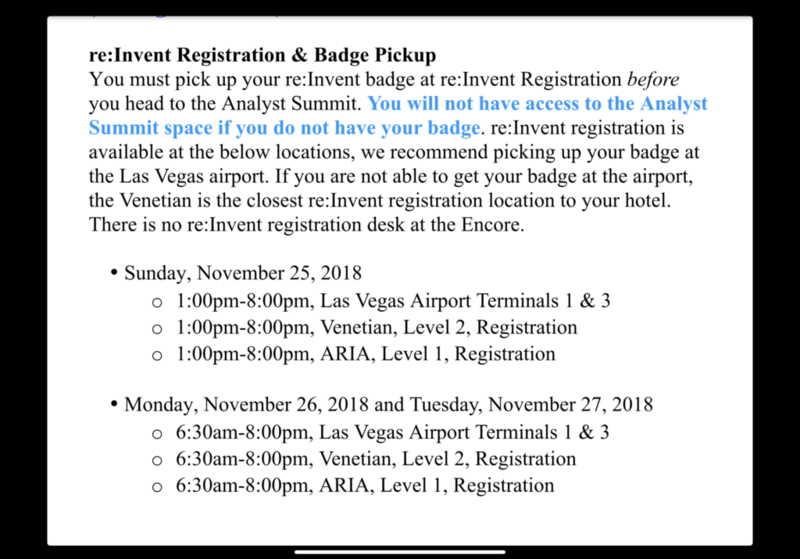 Disclosure: Amazon is a RedMonk customer, and paid for T&E to re:Invent. A fun read – enjoy the trip!